1. Trust your training. You may not have done all the running you were scheduled to, but you have a good base. The adrenaline on race day will see you through a lot. 2. Now we are just a few days away, make sure you get enough sleep, eat healthily,hydrate and if you decide to run before the big day, make it easy and enjoyable. 4. The night before, get everything ready. Clothes, race bib, drop bag, any drinks or gels you plan to use, cash for the c-train, phone for all those selfies and bring a large garbage bag to wrap yourself in while you wait at the start line. It may be a little cool early on and you can stay pretty warm inside a garbage sack! 5. Apart from the elites, everyone else seeds themselves. Think about where you should start. Look for the pace bunnies. They have signs stating their estimated finish time so look for the one nearest your pace and stand near them. If you are planning to walk, you need to be nearer the back of the pack. If you are planning to run fast,then you should be nearer the front. 6. The corral just before the start of a race is a truly exciting and inspirational place to be. Look around you at all the other racers, think about all the sweat and tears that have got everyone this far! Enjoy this special atmosphere. This is what you trained for. 7. There’s the gun, and you’re off! Take it smoothly for the first little while. Everyone is trying to find their pace and a clear space to run. After the first mile or so, things settle down and you’ll find your sweet spot. Enjoy it! 8. If things don’t go quite as planned during the race, don’t worry. Sometimes, no matter how well you’ve trained, your race might not be the one you wanted. This is ok. Enjoy the different experience and use it as a learning opportunity for the next one. i. Don’t run side by side with a large group of friends. This prevents anyone being able to pass you and is annoying. ii. If you need to slow to a walk or stop, raise your hand and move over to the right. It’s the same as when you’re driving and need to make a manoeuver, please look behind you before signalling and then make your move. iii. Again, at water and aid stations, don’t just stop dead. Look around for other runners and allow them space. iv. Don’t photo bomb other runners’ pictures! Of course you want to wave your arms and stick your tongue out for the photographers, but please don’t dive in front of other runners to do so. v. Remember to thank our awesome volunteers. Without them, there wouldn’t be a race. 9. At last! The finish line! 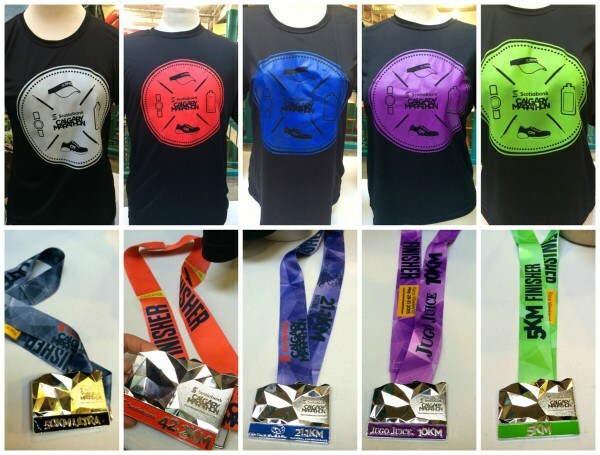 Collect your totally awesome race bling and celebrate your awesomeness! When you’ve done this, taken your photos and eaten something post race, come back and watch others finish. Even more than starting lines, finish lines are very emotional places with runners achieving goals that they never thought possible. You may even see a marriage proposal like last year! 10. Relax, rest, enjoy your achievement and begin to think about the next race! Good luck everyone, and have the best race day ever! This entry was posted in Uncategorized and tagged #Calgarymarathon, #CMS, #CMSforerunner, #expo, #race, #raceday, #runners, #training, bling, Calgary, halfmarathon, marathon, medal, yyc by racrocker. Bookmark the permalink. I like number 1 the best. I once read that soldiers do not rise to the occasion but fall to the level of their training. So ya, trust the training! The same goes for us runners. Great post! I’ve totally been in the camp of not trusting my training lately. I have to remember I have a good base and I can rock it. I am so ready for the FUN! its going to a great time and this years atmosphere is going to be awesome. I am READY to have a great time. And a whole lotta laughs. 🙂 and two medals….we must meet up prior to 5k! !